I’ve been interested in products from Ban.do ever since browsing Instagram and seeing their “Mega Babe” notebook. 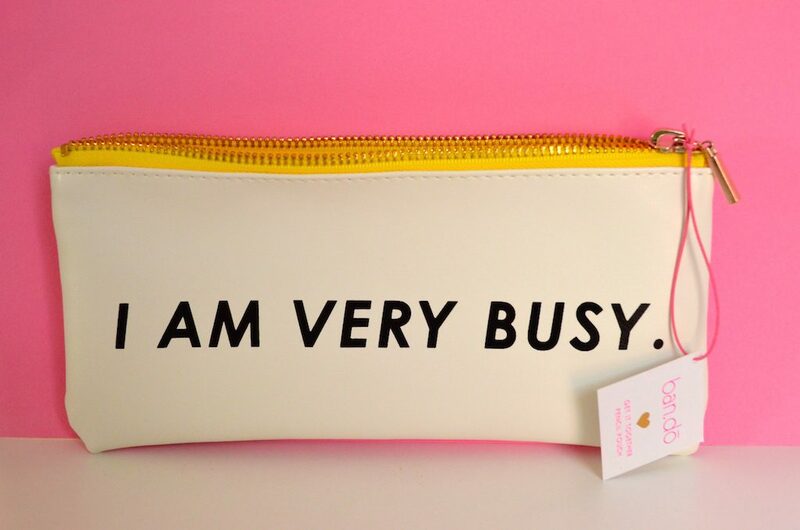 Call my crazy, but I’m ALL about quirky fun stationery and desk supplies. So, in anticipation for my branding shoot (and because I really wanted something from there) I placed an order. Giddy with excitement, I tracked the package as it made its way to my front stoop. 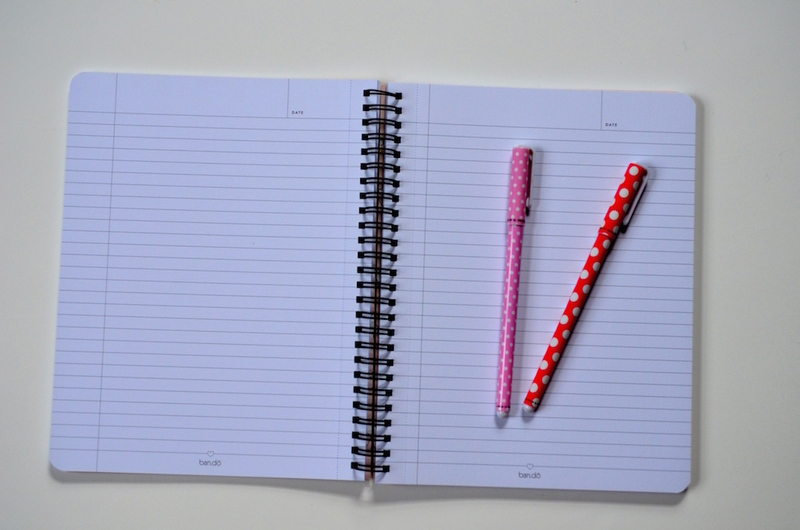 This notebook makes writing down blog post ideas and notes feel extra-special. The front cover has polka dots on a cream background and a cute pink bow in the middle. The bow has “Mega” written on one side and “Babe” written on the other. 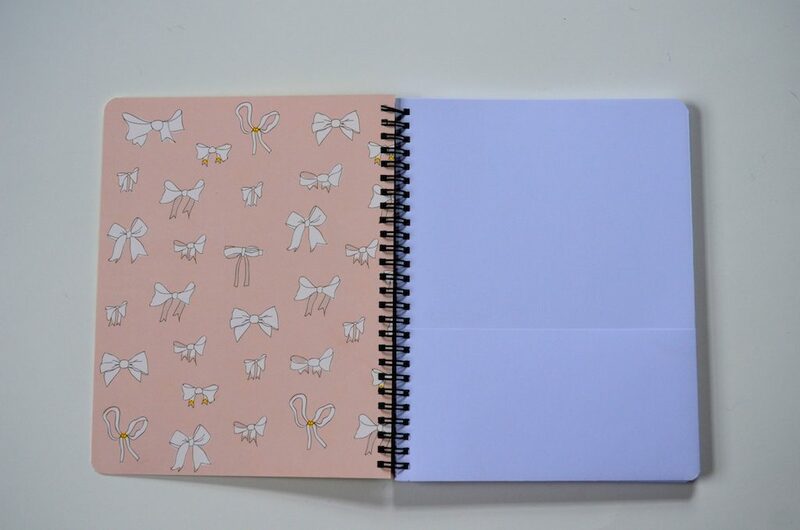 The inside front cover is pink with a sketched white bow pattern. There is also a folder page with two pockets at the front to store miscellaneous items. Each page is lined with a space for the date in the top-right corner and the ban.do logo on the bottom. It’s also really cool that the pages are perforated for easy tearing. In total, there are 160 pages. If it wasn’t cute enough already, the back has a fun (different) pattern! 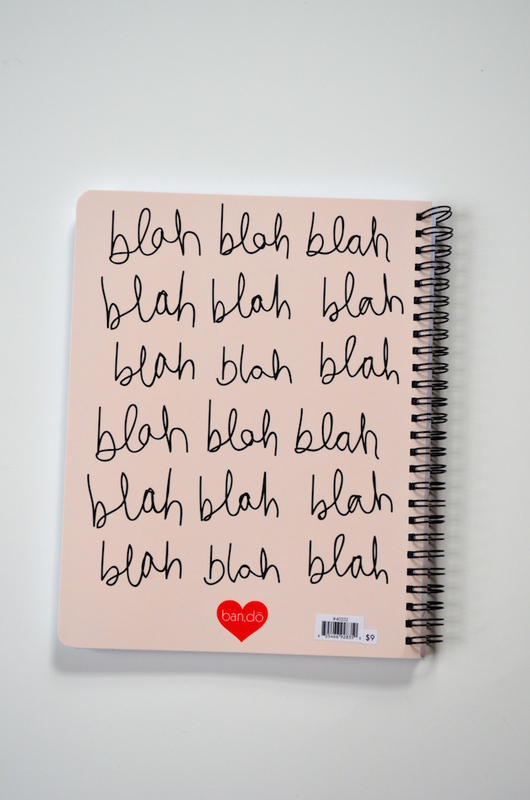 Cursive writing spells out “blah” a thousand times. Adorable. Other notebooks carried by Ban.do include one that has some of their favorite things sketched like “unicorns” and “sleepovers” and a notebook that says “Stay Focused”. I love pretty pens and needed something to hold them in when I’m out and about. I’m old school. I like typing things but when it comes to organizing, I handwrite all my schedules. 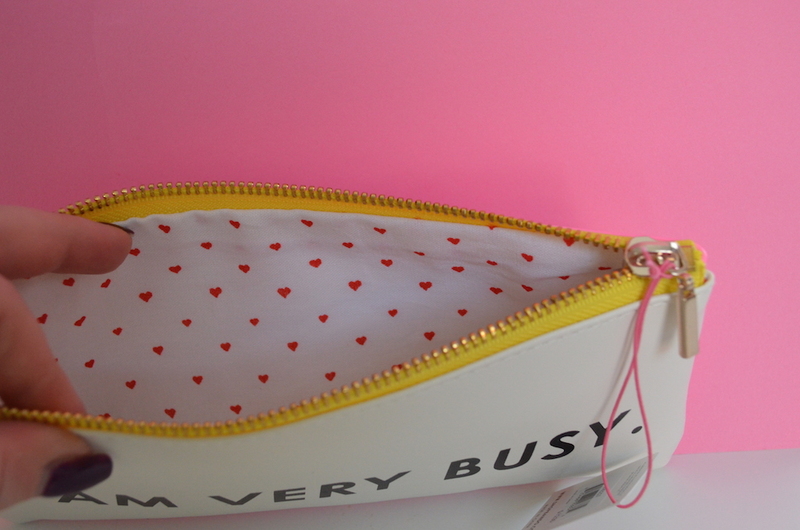 I also thought this little bag would make the perfect lipstick holder for when I’m traveling! Ok, so although I loved the other items, this cup is what really convinced me to place an order online. I’m never drinking enough water (do you?) and I thought I’d convince myself to enjoy more H2O with this extra-cute cup. I’d seen it on Instagram and couldn’t find anything similar so I took the Ban.do plunge and purchased it. 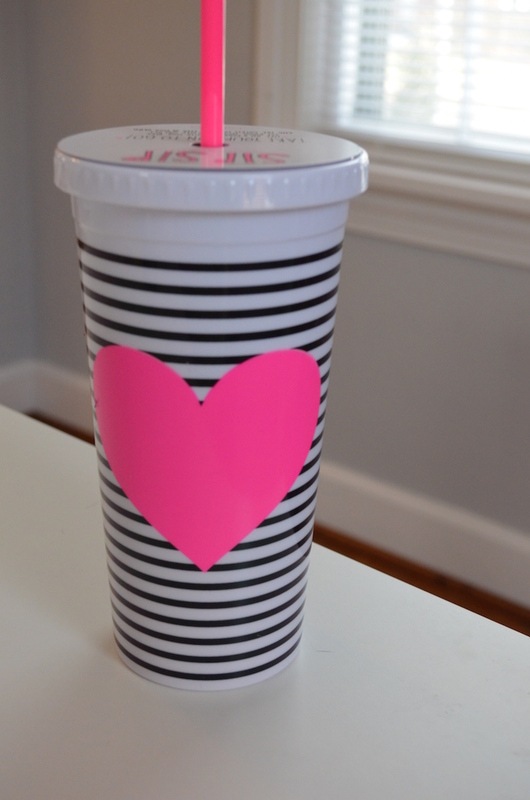 The cup has a neon pink heart with a striped background and a matching straw. I love the cup and the shape but the lid is difficult to keep on. I brought it to the church with me yesterday morning and noticed that the lid has to screwed extra tight to avoid some leakage. There are other styles too from Ban.do and even my favorite tween celeb, Hilary Duff, uses one! Their branding is what really makes Ban.do rock. 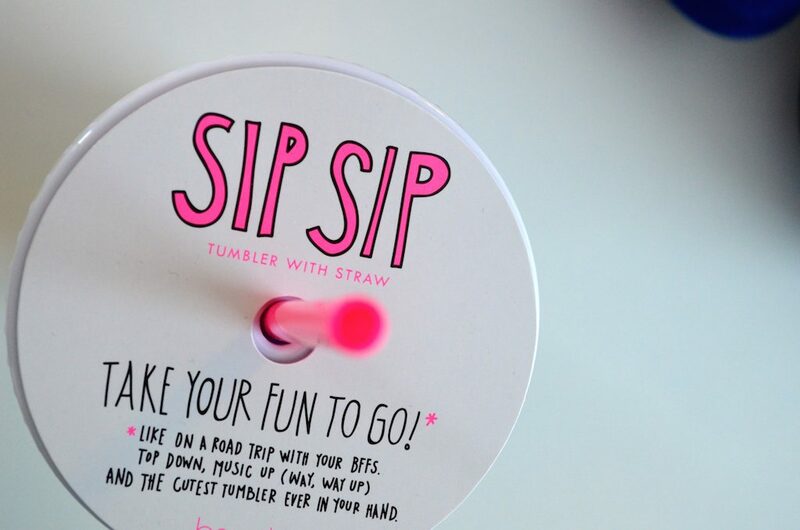 I mean, look at that cute packaging?! 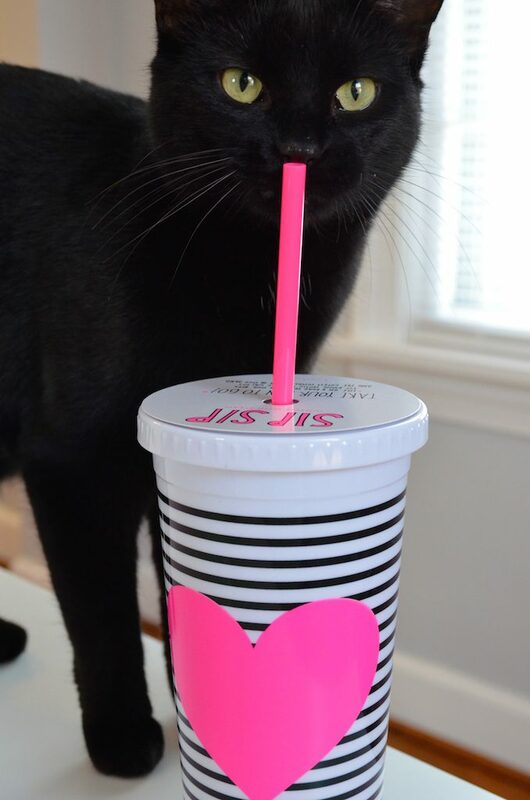 Other tumblers have the saying “Kittens Get Thirsty Too” and other fun patterns. The back of the tumbler has the Ban.do logo on it. Also, here’s my cat who approves. What do you think of my mini Ban.do haul? Have you heard of them? If so, what are some of your goodies? Inside Tip: If you sign up for their email, you get 10% off your first order! i have never heard of this company but the things you ordered are so cute. I am living the tumbler. Ha Bando always makes me smile! I have their But First Coffee mug and it’s so fun!